A bit ago there was a thread about making course maps. I thought I would contribute my method and the tools I've developed in order to design courses and lay them out on site. I use a free, easy-to-use program called SketchUp. It is a 3-dimensional design and drawing program with a really low learning curve. It is remarkably intuitive and lightweight (kind of like our favorite timing and scoring program). And did I mention it's FREE? I won't go into the details of exactly how to use the program itself (though I will of course be happy to answer questions), but I strongly recommend that you download and install it, then just start noodling around with the various tools. Basically, you use a pencil to draw lines in 3-space. 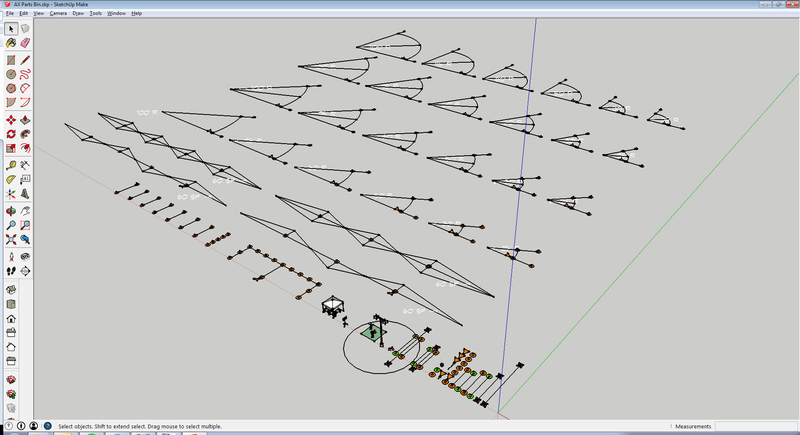 Any time 3 or more connected lines form a plane, SketchUp will fill in the flat polygon bounded by those lines. You can extrude those shapes to form 3D volumes, or build complex shapes by flexing the various lines or adding more polygons. In addition to anything you draw, within SketchUp there are pre-built objects called Components. These are predefined items that you can copy and move around the site. You can create your own components, or download them within the program using the 3D Warehouse. This is absolutely full of component objects that the software publishers and other users have uploaded. I've put together a collection of components that I created for my own use in course design. This has cones, gates, turns of varying radius and degree, and a bunch of other objects you might find on an autocross course. Each piece can be imported individually, or there is a model file you can download for free called AX Parts Bin that has them all preloaded. Each one has geometry that can be used to help with design and field layout. Visibility of this geometry can be adjusted by turning the Halos, and various Guides layers on and off. The real advantage of SketchUp is that you are modeling at 1:1 scale, and it is linked to Google Earth. Start a new model and open the Model Info window. There is a Geo-location tab where you can navigate to your venue in Google Maps and define an area to bring into your model. 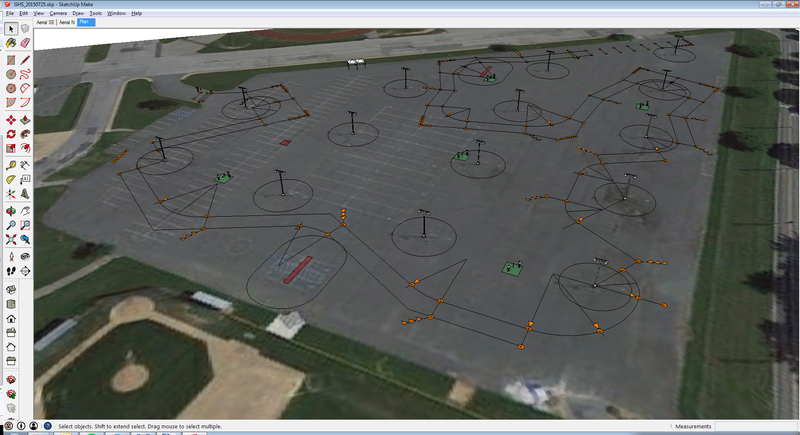 Like magic, you now have a full scale, accurate aerial photo of your autocross lot to design the course on! This image has a flat version, and one that includes basic contours. Unless your site has fairly significant topography, though, it's much simpler if you turn the topo layer off and just work in the flat version. I also recommend you use the Axes tool to change the Red/Green axes to align with the long axis of your lot (the Blue axis is vertical). Working in perspective 3D is natural and intuitive. You can choose to look down from above for the basic layout, and then navigate to a driver's eye view to check the clarity of any given sector of the course. Your model is even oriented correctly in the world, so you can use the program to examine shadows and sun on the day and time of your event! Once you are done with the design, you can change the Camera to parallel projection (which is flat and not distorted by perspective) and go to the Plan view, looking straight down from above. Turning on the Halos emphasizes the cones, and turning on all the guides shows you the radius geometry, etc. You can export this image as a JPEG to print out and bring to the site for layout. Having the aerial background of the lot makes it easy to triangulate on the site features such as light poles, trees, marking stripes, etc. to put the cones where they are in your plan. Hey, I updated the toolkit. I've created more components, and also added directional arrows in many elements. These can be made visible or invisible by turning the Arrows layer on and off. Check out the Autocross Toolkit for accurate, to-scale course design tools.